The Tower of London is a famous monument in London, built in the 11th century. For about 700 years, it has been home of the Crown Jewels. The Jewels were once stolen from the Tower, during the events of the game Mario is Missing!. Luigi had to check the Koopa Troopas in London for the Crown Jewels, and when he found them, he had to return them to the Tower. There was a reward of 2,400 dollars. William the Conquerer built the Tower of London for several reasons: to protect London from invasion, to oversee shipping on the Thames, and to scare his subjects. The original tower was built around 1078. It covers 7 hectares on the banks of the Thames River. At various times The Tower has been a mint, a fortress, a vault, a terrible jail and a place of execution! Famous as a showplace for England's elaborate Crown Jewels, the Jewel House includes the largest cut diamond in the world, 530 carats! The Tower of Victoria, from The Super Mario Bros. Super Show! 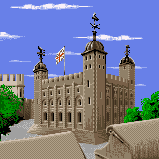 episode "The Adventures of Sherlock Mario," is based off of the Tower of London. This page was last edited on March 29, 2018, at 18:42.